Srixon’s engineers have specifically studied how golfers launch hybrids into the air and come up with “optimized CG locations” for the Z H65. Lower and deeper CG’s in the lower lofts promote higher initial launch, while more rounded soles in the higher lofts promote extra shot versatility from any lie. A new “arc support channel” on the crown gets deeper by loft to promote higher launch and optimal spin. Our Top Gear test threw up just how different hybrids really can be, but what about if you want a hybrid that brings everything together in a single model? 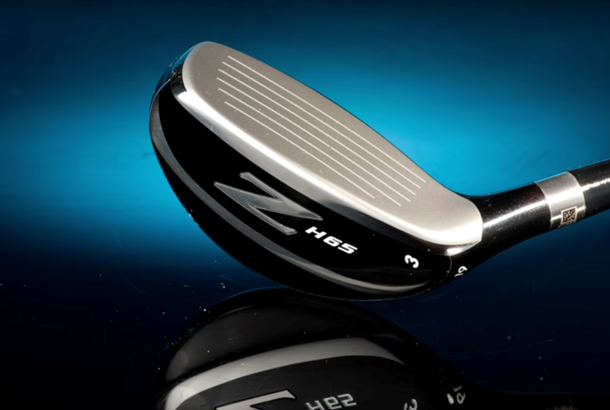 That’s where the H65 enters the conversation, as it’s a real blend of a mid-wide body performance with the lower spin characteristics of a much narrower head. Our test pro loved the feel of the H65 and by carrying all his test shots to within 4 yards of each other we have to say it’s pretty accurate and consistent too. Chris Jones posted his joint longest carry distance average (with the Callaway Rogue) with the H65 which has to say it’s a blend that can work in the club golfers hands as well. Srixon aren’t renowned for their wood designs yet and with the H65 weighing in at a hefty £190 a pop its unlikely to change with this model. But if your game means you like the look of a wider body hybrid, but you’d benefit from lowering spin, so shots are less likely to “pop up” into the air the H65 offers a great solution. For us it’s one of the only hybrids to successfully bring together the good traits from both narrow and wide body camps in a single model.